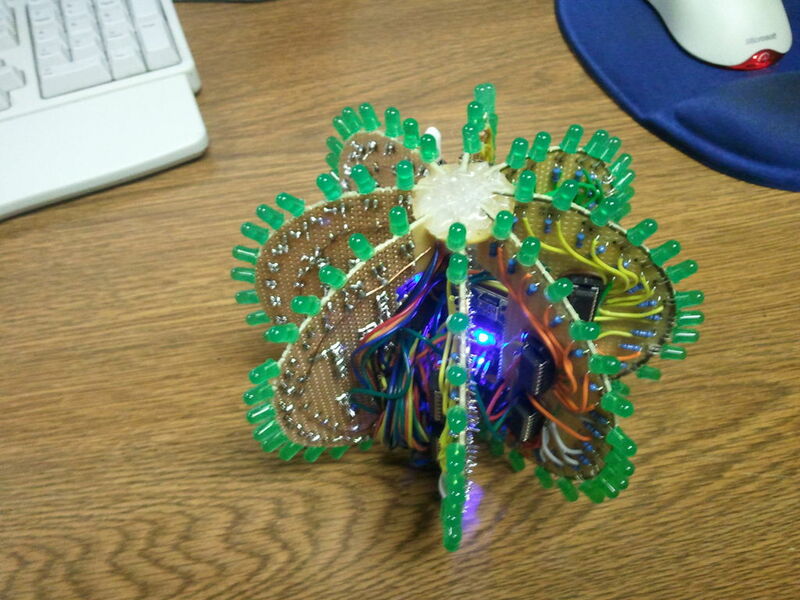 I frequent a blog called hackaday.com which featured a project by “Nikolai”, it was a 10cm LED ball that used shift registers. It seems like a really fun project to attempt but the cost of having the boards made & not having any experience sending eagle drawings to fab shops initially kept me from starting. After some planning I decided to make my own boards by hand although because of that choice I would have to scale up the design dimension wise & reduce the number of “slices”. I started off with rectangular 2200 hole PCB’s from RadioShack and using cutting dykes I made half circle boards with a cutout in the center to to fit the processing module, lipo battery & charger. 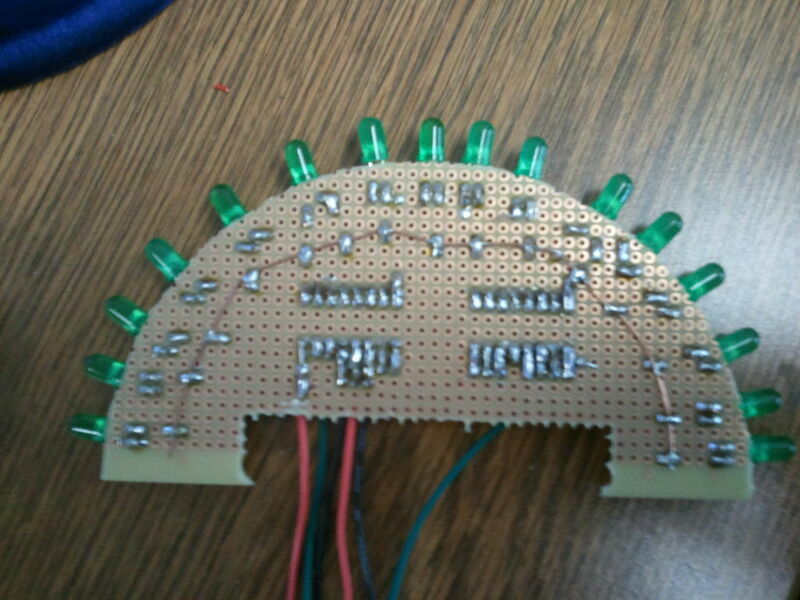 Each slice is comprised of 2 – 8-bit shift registers, 16 LED’s & 16 resistors. There are 8 slices in total so there are 128 LED’s, I use and Arduino nano 3.1 from makershed.com along with a lipo batter & charger available at sparkfun.com. In order to fit these slices together to form a sphere I used circular PCB’s that I found at radioshack. I used a dremel to cut slits every 45-degrees for each of the slices to slide into, the package comes with 3 sizes & 2 of each, I used the middle size. I added a parallax mesmic 2125 accelerometer to the main board in the center to provide orientation to the sphere. You charge the LiPo batter through a USB mini port located in the center, charging takes 1 Hour approximately and lasts for 45 minutes. I wanted to thank Nikolai for the insperation & Null Space Labs HackerSpace for their take on the project. I also wrote Charlie over there to get his input on the spiral animation & he was very nice & helpfull. I am going to post all of the code that I used in case anyone is interested. I wouldn’t say that I am the most proficient programmer & am still learning so be kind.